Stone fruit of all kinds are a great seasonal summer treat, and peaches are a perennial favorite. The lucky among us have childhood memories of incredibly juicy peaches eaten outdoors because they made such a sticky mess (a friend of mine used to insist on her children eating them in the lake, clad in a bathing suit, for the easiest of clean-ups). Learn all about peaches - from how to buy them to how to cook them - with this simple guide to summer peaches. California, Georgia, and South Carolina are the largest producers of peaches in the United States. While these fruits can be found in fine form from April through October, they will be at their very best from June until the end of August. Cooler climates will see local harvests in July and August and into September. Locavores take note: local peaches are not available everywhere. Peach trees flower fairly early in the spring and the flowers are easily damaged or killed by temperatures below about 28° F (−4° C). So you won’t find local peaches in places where temperatures dip below freezing well into spring (Alaska, Maine, and Minnesota all come to mind). The peach is a member of the rose family, cousin to apricots, cherries, plums, and almonds. If you buy peaches at farmers markets, you’re likely to find a wide variety that includes classic clingfree eating peaches, extra sweet and lovely white peaches, and cute-as-a-button doughnut peaches (pictured left). Many farmers plant orchards with a range of trees to extend their harvest season—a combination of early ripening, mid-season, and late-harvest fruit means peaches to sell for months instead of weeks. Ask the grower about the traits for the varieties on offer, or use this Guide to Peach Varieties to learn more. A slight give to the flesh-neither rock-hard nor mushy. Avoid fruit with green around the stem (they aren't fully ripe) or that have shriveled skin (they're old). Note: Peaches bruise easily, so don't use your fingertips to check for firmness. Instead, hold the peach in your whole hand. Have more peaches on hand than you can eat or bake up right away? Peel and slice them, lay them on a baking tray and stick in the freezer for a few hours until they're frozen through. Transfer the peach wedges to a resealable plastic bag and freeze until ready to use. They'll keep at least 6 months (longer in a free-standing freezer) and are perfect to use in baking. Peaches are a great fruit to eat out of hand, just wash thoroughly and rub with a paper towel to remove the fuzz. Sliced or chopped peaches will discolor; toss with lemon juice to retard browning. 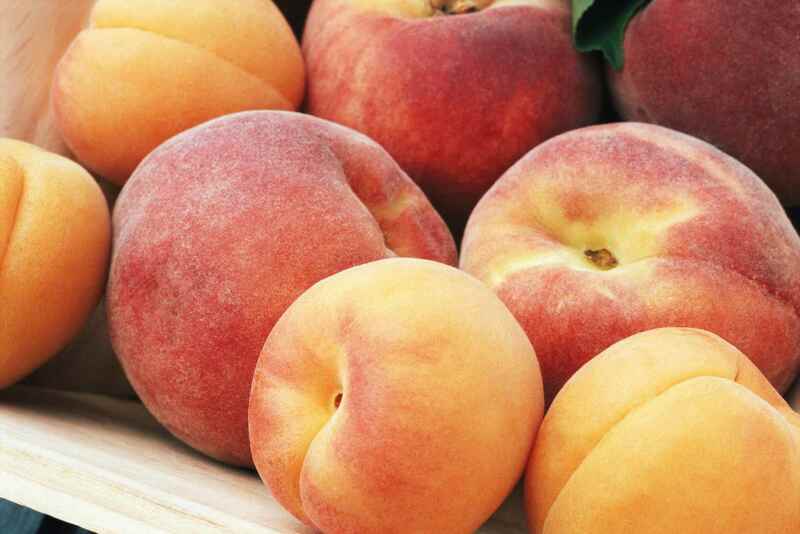 Peaches are simple to use fresh in smoothies, fruit salads, or soaked in red wine. Or add a twist to classic peaches and cream by whipping cream with a splash of almond essence or amaretto (peaches and almonds are a natural pairing). Cinnamon, nutmeg, ginger, coriander, sherry, marsala, and rum are other simple additions to enhance peach dishes. Peaches lend themselves to myriad cooking options such as jam, cake and cobbler, and add tangy sweetness to poultry, pork and veal dishes. Try these easy recipes to start cooking with peaches.